What a game!? Like I said in last week’s preview, crazy things happen in the 2nd weekend in November. The Aggies took a true freshman quarterback in his first SEC conference game and upset the #3 team in the nation on the road. They started 3 true freshmen on defense and played half a dozen more throughout the game. They were a monster Vegas underdog and many people quipped that the 21.5 point spread was not high enough. Coach Sumlin undoubtedly pulled off the biggest upset of his career this weekend. He did it by righting the ship – a ship that had ventured way off course for over a month. With each passing October loss, we tried to explain the inexplicable regression. There had to be a reason and us as writers proposed lack of effort, bad game planning, awful linebacker play, youthful receivers, and inaccurate quarterback play as just a few of the possible explanations. All of those issues seemingly disappeared in the most complete game this team has put together all season. First the man of the hour, Kyle Allen. The 5-star true freshman had a coming out party with the whole nation watching. He threw 4 touchdown passes to 3 different receivers. He played with a poise and presence within the pocket that has been missing much of the season. And you could see him going through his progressions which is extremely impressive considering his youth. Perhaps even more exciting than any of this, he attacked the middle of the field and also took deep shots. Josh Reynolds came up with some huge sideline catches. And Malcome Kennedy torched the Auburn secondary in the middle. When the Aggie offense exploits these areas, it opens up everything else. This is why our running backs were able to average 5.0 yards per carry, while our receivers gained 14.6 yards per carry. All in all, this was a remarkable conference debut for the true freshman. 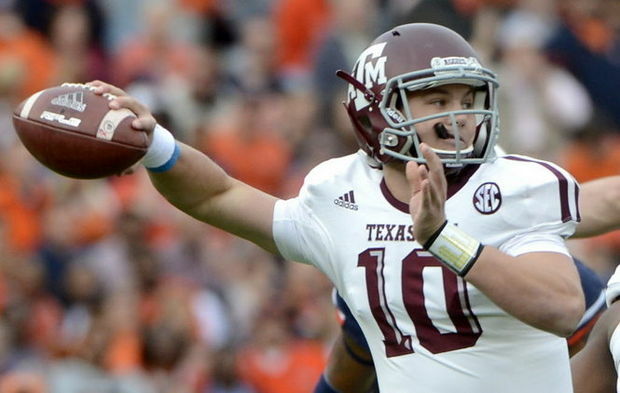 The Aggies appear to have their quarterback of the future. And how about our other 5-star true freshman on the defensive side? Myles Garrett took the reins of this defense and put together a monster game. He was constantly in the backfield pressuring the quarterback. The only way they could stop him was to hold him. He topped all of this off with a field goal block that was returned for a touchdown right as the first half expired. Myles was joined by fellow true freshman SLB Otaro Alaka and MLB Josh Walker who also earned the start on Saturday. Josh Walker was 2nd on the team in tackles for the second straight game which is a very welcome improvement at middle linebacker. Meanwhile, Otaro Alaka was credited with 2 forced fumbles. Both of these guys are playmakers capable of stabilizing the linebacker corps. Several more true freshman saw the field with NG Zaycoven Henderson, DE Qualen Cunningham, DB Nick Harvey, S Donavan Wilson, and S Armani Watts all notching significant playing time. All true freshman, all on the road against the #3 team in the nation. Credit these players for stepping up in a big time game, and also credit the coaches for giving them the opportunity. They will definitely make freshman mistakes from time to time. But as we all witnessed, they play with a passion and aggression that has been sorely missed this season. The 2014 class may go down as one of the greatest A&M has ever had. Already there are 5 players that have earned their way into starting positions (QB Kyle Allen, WR Speedy Noil, DE Myles Garrett, MLB Josh Walker, SLB Otaro Alaka) with several others who have either started at some point this season or earned significant playing time (S Armani Watts and DB Nick Harvey are going to be stars). The future is bright, and these players will only get better. Saturday’s win was only the beginning.